It’s a bit of a strange name, we know. The server was started to help us collaboratively solve John’s scavenger hunt, which all started with the phrase “it’s a tuatara.” We were called #itsatuatara for a little bit, but decided we needed a better name. 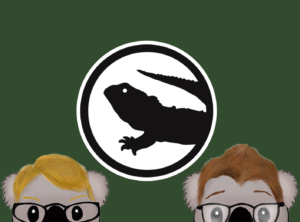 Tuatara + Nerdfighteria = Tuataria. The website is our way of introducing new people to Tuataria. We also have lots of information for people wanting to learn more about Cluesday, about Tuataria, and about Discord. If you think something should be added, let Allison know! Can I invite people to Tuataria? Sure! We just ask that you make sure the people you invite are familiar with the vlogbrothers and nerdfighteria (it’ll help a little with the confusion), and who will follow our rules and guidelines. Please give them the same link we use for everyone else who joins: http://tuataria.com/join. Who or what is a “modmin”? Modmin is a portmanteau of the words “moderator” and “administrator.” We have a team of about 20 people from around the world, and ranging in age from early teen to mid-30’s. We are listed at the top of the Member List and can be DMed with any questions or if you need help! People keep talking about time zones and pronouns. WHY? Also, I can’t upload any pictures. WHY? We have roles for time zones and preferred pronouns. Those can only be added by a modmin. Hang around for 10π hours and you can ask for one, or we might reach out to you if we notice you’re missing one. You can view someone else’s roles by clicking/pressing and holding on their username. These roles give you a few more permissions for uploading media and enabling previews for links you post, which you won’t be able to do if you don’t have a role – this is just a safety precaution in case some decepticons come in and try to cause trouble right after joining. Why isn’t it 5τ? TAU IS BETTER! I don’t make the rules I just type them onto this website. What do these role colors mean? Colors mean a few different things in Tuataria. Some of them represent someone on the modmin team, others are for special honors in the community, and others still are to show the diversity of our community! Pronouns and most ceremonial roles don’t add username colors. A bot just yelled at me? Tuataria has 2, sometimes 3 bots that help with various things, and there is a default Discord bot. Steve helps mostly with modmin tasks, but also helps with our content filter, so he may yell at you if you use a word on our blacklist or do something else you’re not supposed to do. Stitch is usable by all members, with some info in #useful_info on how to use him, but if he’s yelling at you, you probably started it. If he reacted to your post with an emoji, he’s just being friendly (as he’s programmed to do). Clyde is the default bot run by Discord, who isn’t in our server but is always watching. He’s also kind of a buzzkill. If he’s yelling at you, you tried to upload something that got caught by Discord’s content filter, you tried to use an emoji that isn’t in that server, you tried to DM someone you’re not friends with, or you changed your nickname. If Clyde posts a message, you are the only one who can see it. Why are there koalas everywhere? Hank and John, as koalas. Art by guster. What the heck is pregaroo? A kangaroo, we think? Meg(ood18) can confirm. How many docs do we have? There has not yet been a method devised to count the number of documents in Tuataria. Estimates vary from 1 to infinity. You can find a link to the folder containing all the docs in #useful_info. Please be aware that this is a shared drive, and if you are adding a document from a community project or collaboration, please put it into the folder that makes the most sense. If you’re unsure, ask a modmin for help! Check in the Google Drive for a Doctionary, which should explain most inside jokes, nicknames, portmanteaus, and other inside jokes you may see in Tuataria. If something is missing, feel free to ask about it in #not_so_general or #welcome_tuatarians.